General: Elm Family (Ulmaceae). 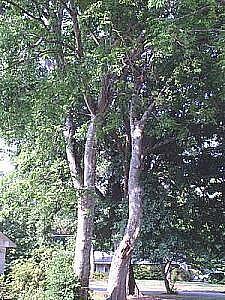 Common hackberry is a large deciduous tree reaching 12 m to 18 m in height at maturity. It typically lives to be 150 to 200 years old and exhibits its greatest annual growth between 20 and 40 years of age. The bark is grayish and warty, and stems have a zigzag appearance. The branches tend to droop, giving mature trees a cylindrical shape and the appearance of even and equal spread of branches. Leaves are alternately arranged, simple, 7 to 12 cm long, and sharply toothed. They are dark green above, paler beneath, have asymmetrical leaf bases (oblique), and sometimes have a rough texture. Flowers are small, greenish-yellow, and emerge in April and May with the leaves. Fruit are small greenish drupes that change to dark red or black upon maturity in September and October.